Dry Ice Blasting in the News! A quick stroll through the Internet turned up this story from Toronto. Where do you turn when your $5 million statue, weighing approximately 22 tons, gets covered in dust and soot from passing motorists on a busy street? 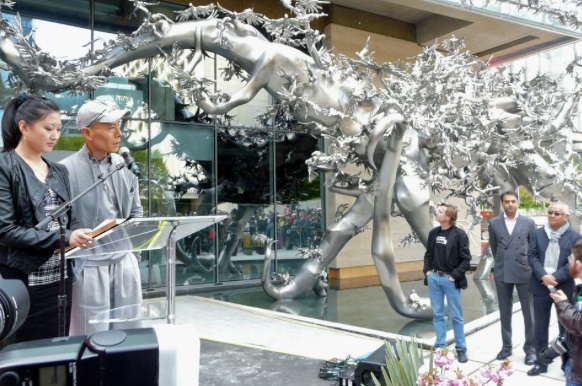 City officials considered washing ‘Rising’, an enormous piece of public art created by Chinese sculptor Zhang Huan that sits on Toronto’s University Avenue, by hand. This was quickly ruled out because site developers didn’t want anyone climbing on the statue, which is a rather intricate piece of steelwork, despite its size. It was further decided that power washing would leave behind an unsightly residue. Eventually a solution was found in the form of local dry ice contractors EcoJet Inc. By using a variety of nozzles to control the spray intensity, and hoses of different lengths to gain access to difficult spots, dry ice blasting saved the day, leaving Huan’s statue gleaming like new, with no scarring or pitting, and no residue left behind. The ability of dry ice to thoroughly clean such an immense object, but with a delicat touch left everyone happy and satisfied.